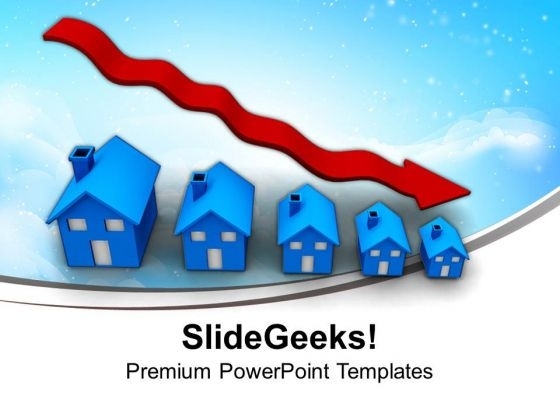 Decrease In Real Estate Rates Concept Business PowerPoint Templates And PowerPoint Themes 1012-Create visually stunning and define your PPT Presentations in a unique and inspiring manner using our above template which contains a graphic of 3d houses going downwards. This image represents the concept of finance and crisis. It imitates chart, currency, data, decrease, economy, estate, falling, finance, graph, investment, loss, market, money, progress, sales. Deliver amazing presentations to mesmerize your audience.-Decrease In Real Estate Rates Concept Business PowerPoint Templates And PowerPoint Themes 1012-This PowerPoint template can be used for presentations relating to-"Decrease In Real Estate Rates, Finance, Symbol Arrows, Business, Metaphor" Examine plans with our Decrease In Real Estate Rates Concept Business PowerPoint Templates And PowerPoint Themes 1012. Download without worries with our money back guaranteee. Amaze yourself with our Decrease In Real Estate Rates Concept Business PowerPoint Templates And PowerPoint Themes 1012. You will be astounded by what is on offer.